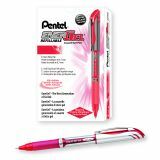 Pentel EnerGel Deluxe Liquid Gel Pen - Deluxe liquid gel pen offers the best qualities of liquid ink and gel ink blended into a super-smooth ink. Vivid, acid-free ink dries quickly without smearing. 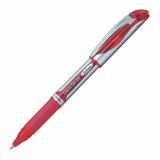 Great for left-handed writers and anyone jotting down notes in a hurry. Barrel accents indicate ink color. Gel pen contains 50 percent recycled content excluding consumable content and refills. Refillable.